can you give me the editor theme? can you give me your used font? The font is Bitstream Vera Sans Mono Bold. I was trying different fonts and I was trying to find a font which takes LESS horizontal space. I found "Estrangelo Edessa" in VSTS. And I stopped searching more. It was what I was looking for. I will try your font and black space too. Can you tell me what is the benefit of using Black bg over a white? I personally feel like alien with black bg. White is so clear. I like black because colors are easier to see. You can use all the colors of the rainbow and they all stand out, but on a white background colors like yellow and orange don't work as well. I need a monospace font, Estrangelo Edessa does not appear too be so. Or is it? I have tested black color and tried setting color. Its that it was okay with me but the problem with me is that I also see the time it needs to setup, for example I work on my machine but tomorrow I will have to work on friends laptop. It will take sometime. I count that time. So i was like only changing the FONT was okay and not changing a lots of things. And btw I see that darker colors on White stand out more than light colors on black but its your own choice. If you feel black is good then Thumbs Up for you! About font, I like a font which should take less horizontal space, more vertical (so that I dont need to add extra line breaks to understand the code), should not have curved corners, and should have SAME thickness on all sides of fonts (like in most of the fonts horizontal lines are thicker than verticals, I don't need that). These are such requirements which I thought were too good to code easily. I want eas. The LCD side is 22 inches and resolution is 1600*1050 and font size is 18. I kinda love it in this way. About "monospace font", what is that thing? Do you mean curvy corners? Then no its not. Do you use an IM? I want to talk to you and want to look fwd to work for you. It would for friendly, not for a cost. Because I like your code style and I want to learn some stuff from you. Monospace means each character is the same width. It allows "ascii diagrams" and alignment of terms on different lines. 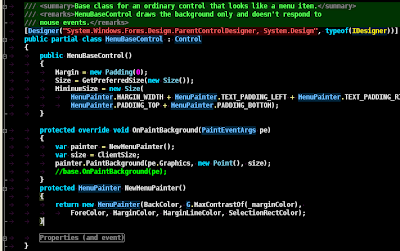 I would like a thinner monospace font, too, but they are uncommon. But I find thin lines are harder to see (I use bold for this reason). I usually don't use IM, but I have gmail.com email, username qwertie256.